The back roads to Royal Cornwall Show, past Ruthernbridge and Lanivet are magical, meandering and lined with wildflowers. They seem which materialise once a year for the annual family day out. There are landmarks like the farm with bright blue gates and the shaded valley garden filled with gunnera. 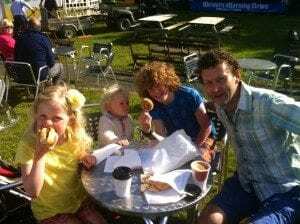 Tim and I are joined by Saskia (2), Bathsheba (7) and Tristan (14) for the trip. Tim’s Dad (like many Cornish farmers) is there too, as a steward, resplendent in his bowler hat and suit. From a toddler parent perspective, the Show is manageable. If you arrive earlyish (around 8.45am) in our case, you can park within five minutes walk of the entrance gates and the tracks were suitable for our McLaren buggy. Obviously the ground is weather dependent, this year was even and dry. It’s quite an exposed site, just outside of Wadebridge, so alway worth packing an extra layer. Just inside the Show, there’s the option for a child wristband, so that your little one has your mobile phone number if they get lost. There’s a creche facility, although we didn’t visit this — which also has baby-changing and feeding facilities. There are three other baby changing rooms on site. In the throes of potty training, I found the loos well placed at regularly intervals with smallish queues. Following the doughnuts and coffee we start with a trawl of the stalls. 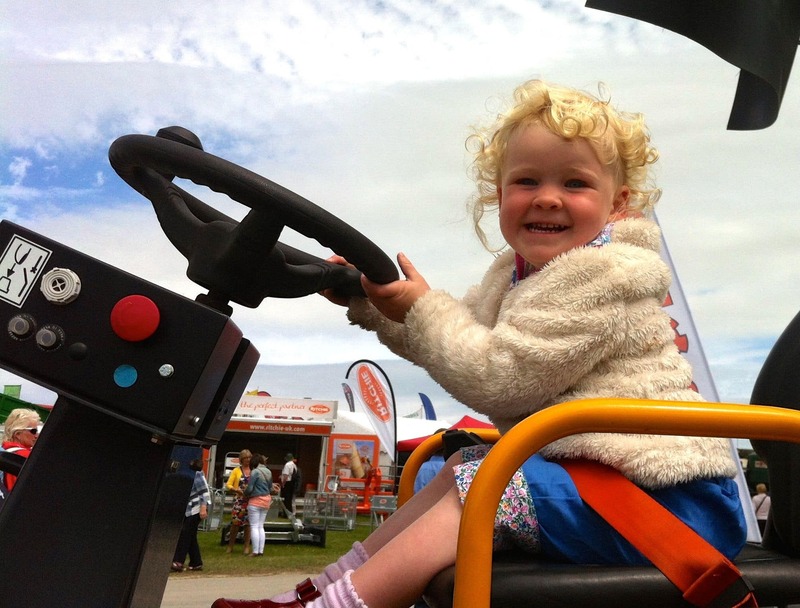 The children enjoyed a sit on gleaming new farm machinery at the Cross farm machinery stand, free lollipops and balloons and Bathsheba decorated a sunflower seed pot thanks to St Petroc’s charity.  Prising Tim away from the renewable energy stands, we head down to the animal tents. Saskia is fascinated by the wonderful range of sights here. From rabbits and chickens through to goats and cattle, the Show provides a fascinating insight into rural traditions. Saskia found the chicken tent — with it’s gobbling turkeys and enormous cockerels — somewhat disconcerting, but she adored the rabbit enclosure with its array of fluffy delights. Inside the pygmy goat tent we found the breeder of Gloria, Gaynor and Izzy – Sharon Davies – celebrating her awards. 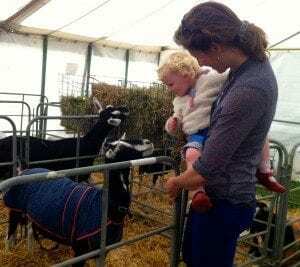 Saskia had a chance to stroke Lennox – the billy who sired Gaynor and Izzy – before making her way to the main goat tent to admire friendly kids and nannies. 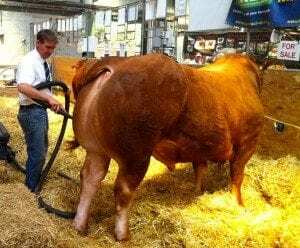 The cattle tent housed a fascinating range of breeds such as Ruby Red Devons, British Simmental and Jerseys was fascinating. The animals and t heir attendant humans people — as they put goats in coats, hairspray bulls’ tails and examine chickens — are equally intriguing! We had lunch in the grandstand, watching the show jumping. Despite the inevitable pleas for a pony, both girls enjoyed the competition, while Tristan waited for the motorbike demonstration. It was hard to find food suitable for toddlers. The chips, pulled pork sandwiches and sausage baps which sated everyone else seemed unhealthy (to us) and unappealing to Saskia. There was a noodle stand and some fruit stands, but I would advise toddler parents to bring food for them. We made do with some with some rice cakes, fruit and plain madeira cake (a freebie from the Howden’s stand)! Our last port of call was the fairground. Saskia shivered with delight at the prospect of the rides and we found several which was very suitable for her, at two and a half years old. She finally fell asleep in the flower tent while we enjoyed a cuppa and a cream scone. 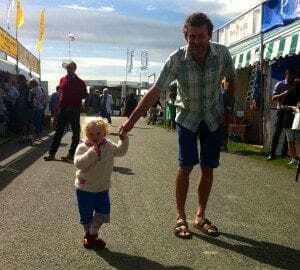 There is something for everyone at the Royal Cornwall Show!